Spread over 140 acres inside the Papago Park, the Desert Botanical Garden houses a collection of over 21,000 desert plants across 4000 taxa, including 139 species which are rare, threatened or endangered. Spread over 140 acres inside the Papago Park, the Desert Botanical Garden houses a collection of over 21,000 desert plants across 4000 taxa, including 139 species which are rare, threatened or endangered. 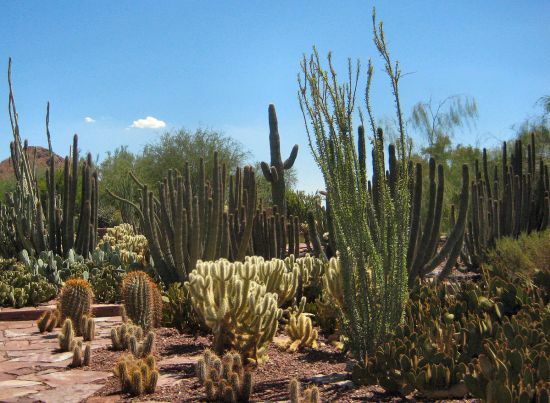 With a focus on plants native to the local Sonoran desert and the Southwest, the 'Phoenix Point of Pride' has flora from various ecosystems such as mesquite bosque, semidesert grassland, and upland chaparral. Of note are the agave and cacti plants in the collection. There are also exotic plants from Australia, Baja California, and South America.